I am not the biggest fan of strawberry-flavored products but when my wife saw this for the first time in the frozen section, we had to try it out. I have always felt alliteration is an important technique used in product naming, and this is another of Talenti’s products where it is employed, along with others like “Lisbon Lemon” and “Coffee Chocolate Chip”. The flavor of this ice cream is in keeping with its name: all you taste is strawberry mixed with milk. Within creamy texture there is occasionally a gritty sensation as you chew on fibrous parts of a whole strawberry, though they are quite subtle so you might miss them. As this ice cream doesn’t have any mix-ins such as chocolate chips or nuts, it feels a little incomplete to me. And while I do enjoy eating fresh strawberries, much of the enjoyment comes from their juicy, almost meaty texture which doesn’t really translate here. One serving is 1/2 cup (104 grams) which contains 170 calories, 60 of which are from fat. There is 24 grams of sugars, a bit higher than many other company’s products, but on the low end of the Talenti line (23 – 36 grams). 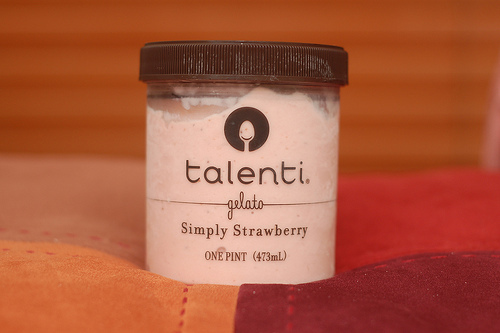 The calorie count is also near the low end for other milk-based Talenti products, although the water-based ones (for example Roman Raspberry) can be as low as 110. Except for the “natural flavor”, which fortunately is listed last, I don’t have any issues with this ice cream’s ingredients. There is only eight and the rest of them are well known substances. For those of you who don’t commonly read ingredient,s you may not be familiar with carob gum. It’s used as a thickening agent and also goes by the name “Locus bean gum”. Though I typically scoff at natural flavors, the taste of this ice cream is so… well “simple” that I feel it really doesn’t need any additional mysterious flavor. I’m not sure what they added but I definitely can’t taste it. The thing I love about Simply Strawberry is that strawberries are used in a higher proportion than sugar, which gives this product its great natural strawberry taste. I checked Bryer’s Natural Strawberry as a comparison and this also have the same order for the first four ingredients. Ben and Jerry’s Strawberry, however, had more sugar than strawberries. In any case, with the high amount of real strawberries, its reasonable to expect some of their nutritional benefits when eating this product. Full ingredients list: Milk, strawberries, sugar, cream, dextrose, carob gum, vanilla, natural flavor. I purchased this at Publix for $5.99 where it had just appeared on the shelves recently. I checked and this flavor has been out for some time in other places. The simplicity of Simply Strawberry is both its best strength and worst weakness. I feel that major fans of strawberry should try this out once, but for the rest of us the lack of a deep or complex flavor limits the enjoyment.